Status type for child to tell its parent how it ended. Return the Widget in which the experiment is running. Get the user-defined "trial type". Get the value of the last response. Get a string describing the object and/or its current state. Run this element with a reference to its parent. Hook function that gets called each time a leaf (i.e., trial) completes. Called when an element's child finishes running. Reset this element to the starting state. Element is an abstract base class for all experiment components. This conceptually includes individual trials, blocks, experiment sessions, series of multiple experiments, etc. Definition at line 59 of file element.h. Shouldn't be used for substantive action, but just for bookkeeping such as timekeeping, autosaving, etc. Default version is a no-op. Reimplemented in Block, and ExptDriver. 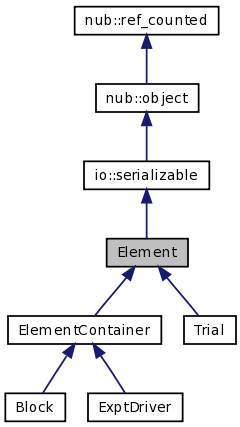 Definition at line 41 of file element.cc. This page was generated Wed Dec 3 06:54:02 2008 by Doxygen version 1.5.5.